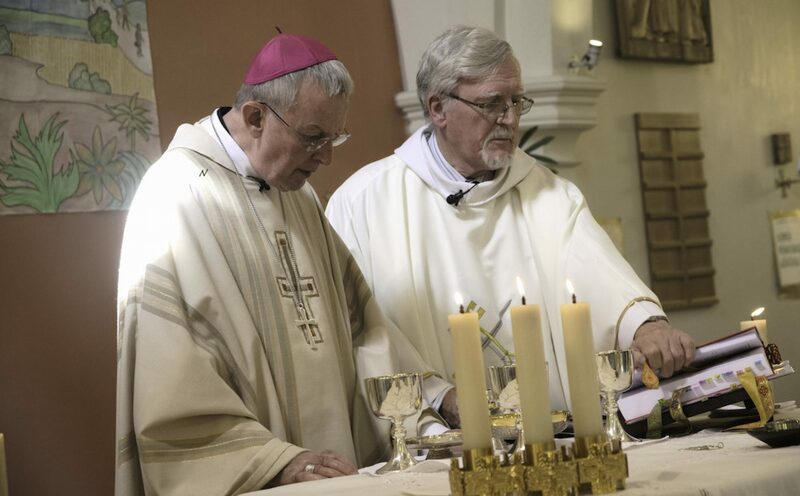 PRIEST: As we draw nearer to Holy Week, the conflict looms larger: the conflict between Jesus and the religious authorities of his time; the conflict between life and death, light and darkness, condemnation and forgiveness. We hear in today’s Gospel how Jesus heals and forgives the women taken in adultery, brings her and us new life, and will not condemn and judge. He expects us his church and disciples to do the same – fling wide open the Gates of God’s Mercy. Or are we no better than the Pharisees he challenged? PRIEST: In just two weeks time we shall celebrate the incomparable joy of the Resurrection of Jesus Christ. Jesus foreshadows his own resurrection by bringing his friend Lazarus from the tomb into life. He reveals to all that he is victorious over death itself. But the greatest victory Jesus wins is over the death that is sin, which distorts and wounds our world with its oppressive structures. Let us repent, and invite Jesus to rise victorious over sin and oppression within us, unbinding us and setting us free. PRIEST: Jesus comes among us, to offer the Water of New Life to all the peoples of the world. He calls us to drink deeply of His Spirit and come to a new beginning. It is fitting that today we welcome especially our elected Catechumens to receive the gift of Faith expressed in handing on the Creed of the Church to them, as they prepare for Easter Sacraments. As with the Samaritan woman of today’s Gospel, so with us – he knows us through and through! Being the Face of the Father’s mercy’ He reaches out to the most excluded and scorned! Let us all with honesty recognise when we judge and so exclude others from our hearts, bring our need for repentance and forgiveness to Him, and then drink of His mercy and His Spirit. PRIEST: We have hardly begun our Lenten journey, yet we are given a glimpse of the glory to come: the glory Abraham beheld at the moment of covenant; Jesus clothed in the glory of God on the mountain of the Transfiguration. That vision will give him the courage to embrace the Cross that he sees lying ahead of him; that vision will enable the apostles to hold on in the dark days of Calvary. In our darkest moments God gives us enough light to guide our steps and encourage our faltering hearts. But do we trust him? PRIEST: Today we hear how David refuses to give way to vengeance on King Saul; St Paul tells us to become more and more like Jesus, the heavenly man; and Jesus himself confronts us with the foolishness of God! He challenges us to love our enemies, to return blessing for a curse. He urges us to share the very compassion of God with a generous and giving heart. It is foolish talk, unrealistic idealism for the world … Is it the same for us? Or have we the courage to live the foolish generosity of God here and now? PRIEST: Jesus is the Prophet of the Poor – the Voice of the Voiceless. We hear this morning Luke’s version of the Beatitudes – the Blessings of the Kingdom. But if the Poor are blessed, if the world is to change to raise up the poor, then the world of the rich must radically change! Jesus’ Kingdom turns the world’s order of things upside down! Are we going to be ‘turning the world upside down’? Are we going to stand with Jesus where he is … among the poor, powerless and voiceless? What a challenge to the Church – what a challenge to you and me!